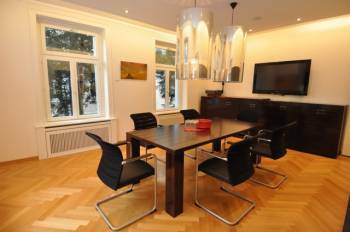 Rent out this well equipped meeting room close to the lake “Zürichsee” for your next small meeting in Zurich. Beamer and flipchart are already included in the room hire price, and you can also make copies and scans for a fee. A fax is also available. The half-day price for this room is 280 CHF. www.conferencehotels.eu offers you a free and comfortable search for conference hotels in Zurich. Here you will find the most popular conference hotels which Zurich has to offer and which you can request directly online with the best conditions available.